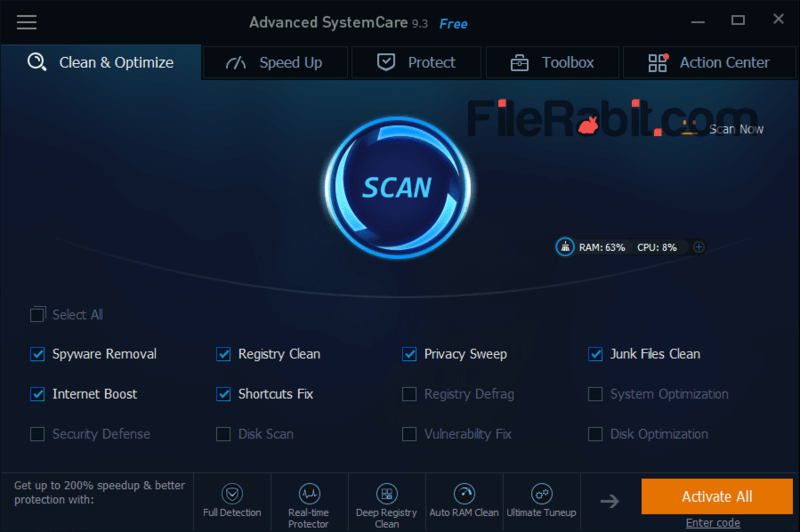 Advanced SystemCare can make boost computer performance with optimizing startup programs, cleaning registry, removing bad entries and deleting temp files. Many of user’s talking about slow speed of computers. There are multiple reasons that makes a computer lazy and slow. Bad values in registry editor, start up running programs, load of unnecessary programs as well as temporary files. These are main reasons which will hurt windows speed but we have a solution to fix bad registry entries, remove startup programs, uninstall unwanted programs and remove unnecessary browser integration. Advanced SystemCare has a set of tools where you can eliminate registry errors, privacy issues. junk files, internet problems, shortcut errors, remove empty folders, clean temp files, remove bad values from registry editor, customize startup programs or uninstall any software from list. Many software includes sub-programs inside main setup that may hurt PC performance with putting load with unwanted processes. The only solution you need a doctor for PC that will take good care of processes, programs, registry and other main structure as well. It will perform a quick scan to gather system faults, warnings and errors inside windows. AVG PCTune and Tuneup Utilities are awesome system tunning programs but they are not free and we need higher price to buy them. Advanced SystemCare is one of free application that can protect, speed up and repair bad points of PC. As a super computer maintenance program, it takes 1 minute to scan computer for errors. However, this all in one software suite will boost computer speed, remove suspicious entries, fix corrupted values in registry, customize installed programs as well as startup programs.